this method usually use mold to melt the plastic, deformed with applied pressure and the product shape will same as the mold shape. this process can produce along product with fixed cross-sectional profile such as wire and cable coating, plastic tube for printer ink, some hollow profile and various solid profile. the material is pallet or plastic chips that are usually dried in a hopper before going to the feed screw. to process extrusion method used injection machine, The plastic heated at barrel to molten state then forced through a plastic mold die that is in desired shape. look at picture below to learn more about extrusion mold. * Reheat and blow molding. Compression molding is a method of molding in which the plastic, generally preheated, is first placed in an open, heated mold cavity, they are four step in compression molds they are loaded charge, charge compressed, cured the charge and ejecting process of product. the main construction is Punch (cavity side), core molds and ejection system. the concept of RIM is Two reactant liquids are heated and brought together under high pressure. one example process is polyurethane RIM, At the heart of the polyurethane RIM process is a chemical reaction between the two liquid components, which are held in separate, temperature-controlled feed tanks equipped with agitators. 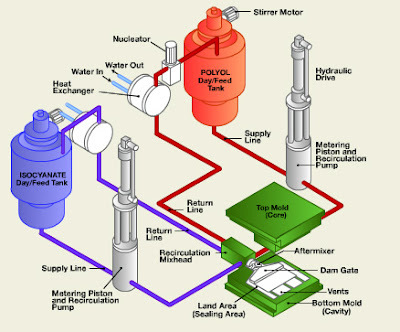 From these tanks, the isocyanate and polyol feed through supply lines to metering units that precisely meter both components, at high pressure, to a mixhead device (http://www.rimmolding.com/rim/index.html), look at picture below, those picture shown two chemical reaction process mold isocyanete (blue tank) and polyol (red tank) . the advantages of RIM is Strong, flexible, lightweight parts which can easily be painted. Quick cycle times compared to typical vacuum cast materials, the disadvantage is slow cycle time because must mixed before formed by mold. like compression molding, is a process where the amount of molding material (usually a thermoset plastic) is measured and inserted before the molding takes place. The molding material is preheated and loaded into a chamber known as the pot. A plunger is then used to force the material from the pot through channels known as a sprue and runner system into the mold cavities. The mold remains closed as the material is inserted and is opened to release the part from the sprue and runner. The mold walls are heated to a temperature above the melting point of the mold material; this allows a faster flow of material through the cavities. Rotational molding or moulding is a versatile process for creating many kinds of mostly hollow plastic Parts. The phrase is often shortened to rotomolding or rotomoulding. molding. Lately, there are more and more applications for this technology. Huilong Plastic Machinery Co.,Ltd offers Hermoforming Machine, PET Blow Molding Machine from China . A very descriptive post! Nice to read it. Suggest such a post on pcb assembly services too which can be of our help at Bergen systems. I had no idea polyester can be also used in pultrusion! Our companys products are Blow Moulded Tanks, Blow Moulded Water Storage Tanks, PVC plumbing pipes, PVC pipes, PVC riser pipes, UPVC pipes, Water Storage Tanks and All type of pipes fitting, Supplier, Wholesalers, exporters & manufacturers in India.Specialized in Blow Moulded Tanks, PVC Pipes, Plumbing pipes,Blow Moulded Water Storage Tanks Supplier, Wholesalers, exporters & manufacturers in India. Our companys products are Blow Moulded Tanks, Blow Moulded Water Storage Tanks, PVC plumbing pipes, PVC pipes, PVC riser pipes, UPVC pipes, Water Storage Tanks and All type of pipes fitting, Supplier, Wholesalers, exporters & manufacturers in India. Thanks for this post. It is very useful for us. We have also same product in CPVC pipes & fittings. The information which you have provided is very good. It is very useful who is looking for Plastic Pet Bottles Manufacturers. Bottle Grade Pet Resin Manufacturers are doing everything they possibly can to make their products environment-safe. Are you interested in learning more about reuses of plastic? Stay connected. Thanks for sharing with us.I am interested to look another great post. Very nice blog. Describing all phases about moulding technology clearly. Vectus Blow Moulding Water Tanks are best example of blow mould technology. The information you have provided about is really nice. All of those points are so very true, We are in business of manufacture Blow Molding, Injection Molding & Custom Molding including Industrial Containers, Automotive Plastic Components and Healthcare / Infrastructure Furniture parts & Medical device parts. This post gives detail information about the plastics making process. Thank you for sharing.The driving chain or chains are at any one end of the rollers and are covered from the surrounding environment. Thanks, for such a great post. I have tried and found it really helpful. For more details to visit Profile wire manufactures in India. great blog about molding products. Thanks for sharing this informative blog. I can easily say that this is a nice company as Pet Jar Mould Manufacturers. If someone is looking to buy mould machines visit here.